The Community of Writers has produced several books and journals that represent the fruits of our conference. For announcements of new publications, please join our mailing list. 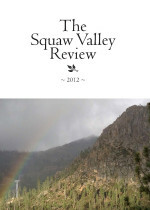 One of our most notable publications has been Written Here: The Community of Writers Poetry Review (formerly The Squaw Valley Review), where alumni poets continue the tradition of publishing a collection of poems begun during the Poetry Workshop. Poets from the most recent workshop submit three poems, completely revised or exactly the same as the day the poem was first imagined. Volunteer alumni editors select the poems to appear in the Review. Proceeds benefit the Scholarship Fund, enabling talented poets to attend. 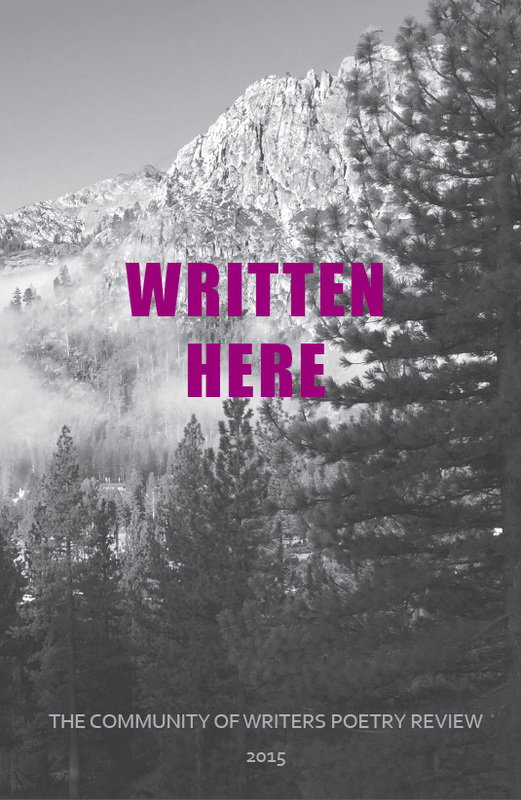 This edition of Written Here contains a historic first for the Community: it contains work by each and every one of the poets who attended in 2017. The result is an astonishing look into what this generous and supportive week can produce. In addition to work by every 2017 participant, poems first written during that week by the six teaching staff poets also appear within these pages. 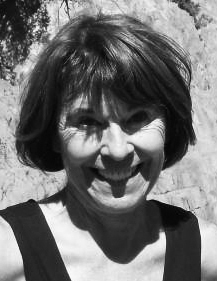 2017’s Guest Director Brenda Hillman’s “Dawn Tercets with Blake & Nuthatch” opens the collection, which also includes Francisco Aragón’s “Helen Speaks”, “Life Coach” by Forrest Gander, “Small Act of Homage” by Robert Hass, “I Do Not Know If It Is True, But I Think” by Sharon Olds and “Convertible” by Gregory Pardlo. Proceeds benefit the Poetry Workshop’s Scholarship Fund. Edited by Aaron Graham and Roger Soffer. Cover art courtesy of Ananda Lima. 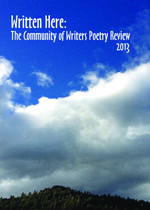 Proceeds support the Community of Writers Poetry Scholarship Fund. 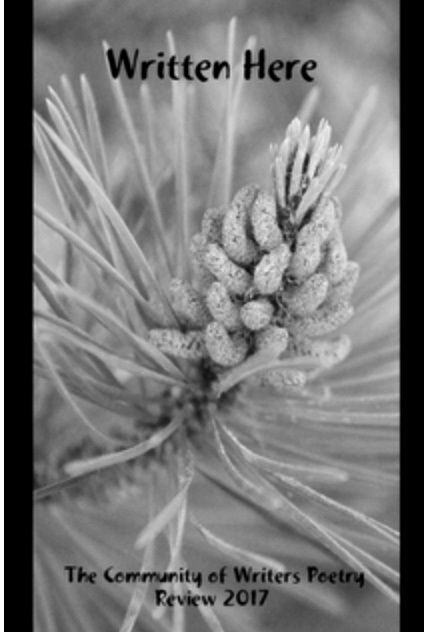 Invite some of the magic of wind on the mountain and warm days in the valley into your mailbox. From the turbulent summer of 2016, 43 poets bring you 67 poems. This edition of Written Here presents a selection of the pieces that emerged from our week of poetry workshops. Edited and designed by participant volunteers from the workshop, it’s a beautiful anthology that reflects a range of subjects, a variety of styles, and concerns that continue today. Edited by Amy Elisabeth Davis, Richard Sime, Christine Gosnay, Abriana Jetté, Trisha Peck, and Roberto Santiago and designed by Cody Gates and Maureen Forys, the book’s profits go to the Community of Writers Scholarship Fund. Every copy you get for yourself or someone else is also a gift to a future participant in the workshop. Note: This is a revised and corrected edition. 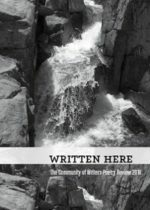 If you have already purchased a copy of Written Here 2016 at the June 2017 fundraiser or at the 2017 Community of Writers bookshop, write to squawpoets@riverfog.net and we’ll tell you how to replace that earlier edition with this new one, gratis. 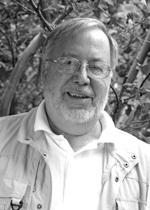 The 2015 Review, dedicated to the late C.D. 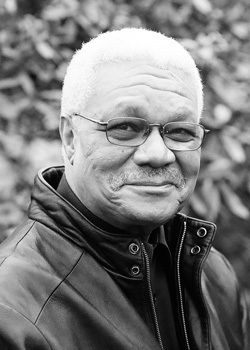 Wright, The poems appearing in Written Here: The Community of Writers Poetry Review 2015 all had their genesis during the 2015 Poetry Workshop. 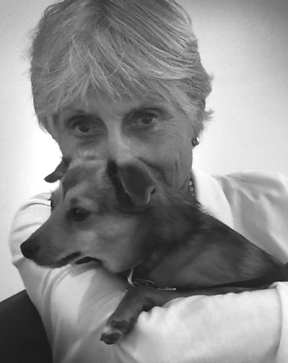 The anthology was edited and designed by volunteers from the workshop, including KB Ballentine, Judy Brackett, M.D. Myers, Caitlin Neely, Jon Riccio, Carolyne Whelan, Emily Wolahan, and Jules Wood. Proceeds benefit the Poetry Workshop Scholarship Fund. 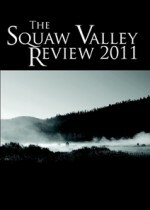 In the 2014 Squaw Valley Review, alumni poets continue the tradition of publishing a collection of poems begun during the June 2014 Poetry Workshop. 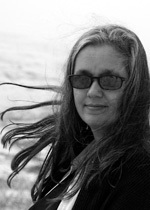 For this issue, all participant and staff poets from the 2014 workshop were invited to submit three poems, revised or the same as the day the poem was first imagined in June 2014. Volunteer editors, alumni from the same annual workshop, selected and edited the poems that appear in the 2014 Review. Proceeds benefit the Poetry Workshop Scholarship Fund. 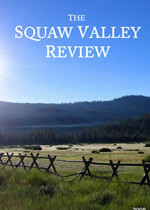 The 2013 Review is dedicated to Galway Kinnell, and was edited by William Clark, Jennifer C. Humbert, and Lori Singer Meyer. 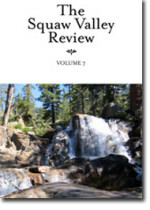 Written Here: The Community of Writers Poetry Review 2013 continues the tradition of publishing poems that first emerged during the summer’s Workshop. 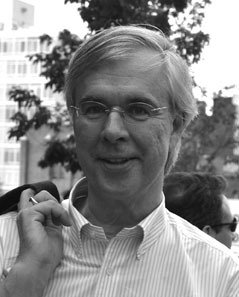 The poems appearing in Written Here were selected by a team of editors, themselves workshop participants, from the work submitted by their fellow poets. Proceeds benefit the Poetry Workshop Scholarship Fund. 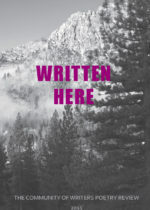 The 2011 Anthology includes poems by staff poet Brenda Hillman and interviews with Sharon Olds and Cathy Park Hong. 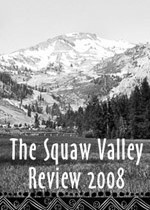 Since 1969, the Community of Writers at Squaw Valley has helped develop the art and craft of many who are now household names. 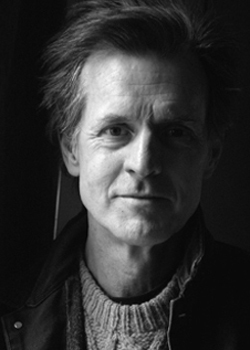 Instructors such as Michael Chabon, Mark Childress, Diane Johnson, Anne Lamott, Robert Stone, and Amy Tan have distilled their advice and wisdom from seminars and lectures, and the result is a book that captures the workshop experience of complete submersion in the writing process. 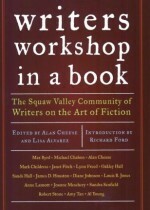 With an introduction by novelist and short story master Richard Ford, himself a conference attendee in the 1970s, this volume gives the writer and dedicated reader a jolt of inspiration, sharp insight into matters of technique, and a feeling of camaraderie with a writing community. 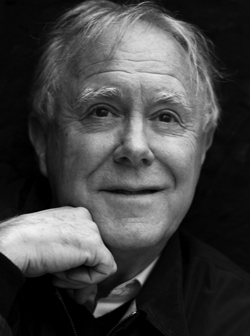 Peruse our Notable Alumni pages and the Omnium Gatherum & Newsletter for news about alumni books and projects.